Students may create an extra credit project. 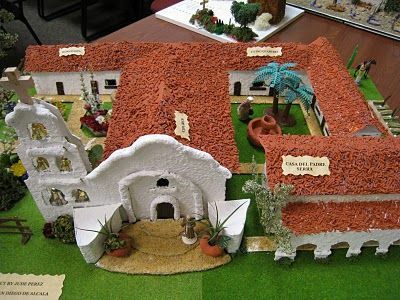 Students may create ​a model of the California mission they researched. ​Dimensions & materials: Again, we'd like the mission to fit on a student desk, so please make the base no larger than 17" by 23". Any materials will be fine, as long as the model is made by the student, and is not made of LEGOs or from a kit. NOTE: projects larger than a student desk (17 inches by 23 inches) or made from a kit, including LEGOs, will receive no credit and be sent home. The project should reflect several hours' worth of work by the student, hand-completed by the student and decorated. Content: The model may show the entire mission grounds, or just include the main chapel/church building. Be sure to refer to the rubric your child brought home for more specifics on grading their project. Oral Presentation: Students who make California mission models should be prepared to give a brief presentation to the class. They will explain how they created their models and what resources they used. Inspiration: To see varying levels of mission models, visit our webpage from previous years. For other examples from around the web, click here. Dimensions & materials: Your items in your diorama may be made of clay, paper, or other natural materials. It should be small enough to fit on a student desk. A shoebox is a perfect start to your diorama, and guarantees it fits on a student desk. You may use it with all 4 sides in place, or cut one side off, or use the top. NOTE: projects larger than a student desk (17 inches by 23 inches) or made from a kit, including LEGOs, will receive no credit and be sent home. The project should reflect several hours' worth of work by the student, hand-completed by the student and decorated. Oral Presentation: Students who make a model of a period in California history should be prepared to give a brief presentation, telling what they have learned and the importance of that period in California history. Accessories: You may use plastic figures (Playmobil, Lego, etc.) if you can make them fit the diorama time period with their clothing.